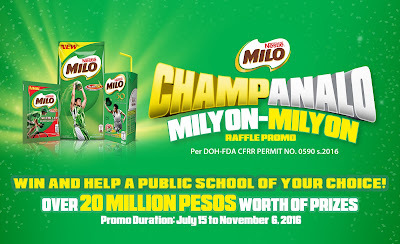 MILO’s commitment in building champions continues with the MILO Champanalo Milyon-Milyon Raffle Promo. 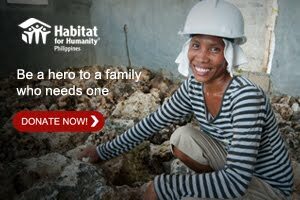 The nationwide raffle that offers over 20,000,000Php in prizes, and empowers the winners to build future champions by helping a public school of their choice. The ongoing raffle promo will be having the next Weekly Raffle set on October 8. The Grand Raffle is on November 6, 2016. The promo will have 10 Weekly Draws with four winners each, that will be held in 22 radio stations. The weekly winners will receive 2,000Php. Special Draws in each Regional Leg of the MILO Marathon will also be given, the five winners will each receive 10,000.00Php cash. Non-winners of the Weekly and Special Draws will automatically be qualify for the Grand Draw. In the Grand Draw, a total of 36 winners (four each from nine areas nationwide and eight from the National Capital Region) will win cash, and also help fulfill the dreams of public school children. For “small pack” entries, winners will get 300,000Php, while the public school of their choice will win 100,000Php worth of Champion Fund. For “large pack entries”, winners will receive 400,000Php, while the public school of their choice will win 100,000Php worth of Champion Fund. To join, participants must purchase the participating brands: MILO Tonic Food Drink or MILO NUTRI UP 3 in 1 Chocolate Malt Drink for Adults or MILO Ready-To-Drink Tonic Food Drink. (See the complete required packs at www.milo.com.ph/Champanalo). Then, on a clean sheet of paper, participants must write their whole name, age, address, contact number, and the public school of their choice. Participants can choose the school from the Master List of Public Schools found in the official website of the Department of Education (www.deped.gov.ph). MILO’s grand giveaway is open to all Filipino residents 18 years old and above. 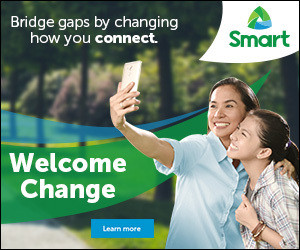 For the complete mechanics of the promo, visit the website (https://www.milo.com.ph/Champanalo) or MILO’s Facebook page (www.facebook.com/milo.ph).